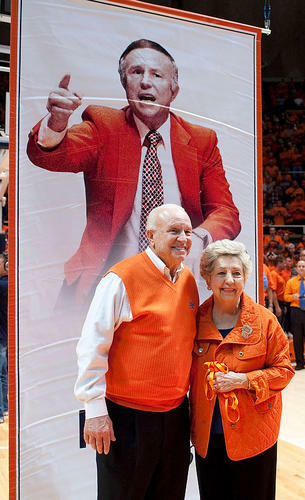 The University of Illinois raised a banner in Assembly Hall honoring former basketball coach Lou Henson on his 80th birthday. The Illini men added their own salute with a 79-74 upset win over #5 Ohio State, Brandon Paul scoring a record 43 points. The banner was unveiled at halftime of Illinois' game against Ohio State on Tuesday. Henson and his wife, Mary, attended the game. Henson is the highest winning basketball coach in the university's history. His teams were 423-224 in 21 seasons between 1975 and 1996. Henson led the Illini to 12 NCAA Tournament appearances. Among them was the 1989 Flyin' Illini Final Four team.